What drew you to write about the Regency period? 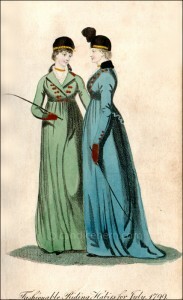 The first fashion print I ever bought, from the Lady’s Monthly Museum, July 1799. I’m a history buff and have certain specific periods that fascinate me: Ancient Egypt, Tudor England, 18th century France, and Regency England. I have shelves of books on each of those periods, but more on Regency England than anything else. I also have been collecting Georgian and Regency antiques for years, and any serious collector learns what she can about the historical context of the collected items. One of my earliest, and biggest, collections is of Regency fashion prints. Through those prints, I truly fell in love with the period, and especially its fashion. I love how the elegant, slender Regency silhouettes are squashed between eras of giant hooped skirts. But I am also fascinated with the Napoleonic Wars and how they impacted Regency life, and how the beginnings of the industrial revolution began to change society. It’s simply a fascinating time, with a small core of glittering, affluent Society set against the new Romanticism, new republican ideals, and constant war. So I already knew a lot about the Regency period long before I discovered Georgette Heyer and all her modern step-children — the wonderful Regency romances being written back in the 1980s and 1990s. One day a friend saw me reading yet another Regency romance and said, “You know that period so well, why don’t you write one of those book?” And suddenly several story ideas just popped into my head. That’s how it all began. Jane Austen! I never tire of reading those six wonderful books. I also adore Georgette Heyer. As for modern authors, I have too many favorites to name, but I do recommend good books frequently on my Facebook page. Are all the items shown in the “collections” yours? Yes, the items are all from my private collections unless otherwise stated, e.g. the paintings shown in the article on shoe buckles. I am intrigued by the lover’s eyes in your collection. Where can I buy one? 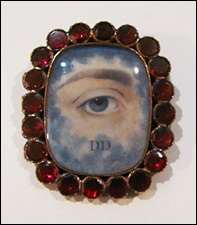 Of all the collections on this site, the lover’s eyes seem to fascinate people the most. I receive at least one email per week asking where to buy one. The only thing I can recommend is when buying expensive antiques of any kind, always work with reputable, trustworthy dealers. Lover’s eyes, in particular, are very expensive items. Genuine ones — and there are MANY fakes out there — seldom cost under $2500, and generally are much more than that. Be very cautious when buying one. I would not recommend buying one on eBay unless the seller offers a solid money-back guarantee. In general, a lover’s eye is something best purchased after closely examining it in person. I was at a large antique show recently where three very reputable dealers had eye brooches and lockets and rings available, ranging from $3000 to $10,000. So, even though they are fairly rare, they can still be found — for a price.